I can’t say I was all that thrilled when Duran Duran released Arena in 1984. It was a live album, which meant it sounded nothing like the meticulously-crafted studio albums that I put on repeat on the family turntable. Back then, I hadn’t yet gone to any concerts, so the idea of live album-as-souvenir didn’t really resonate with me. I just knew I preferred the studio version of “Is There Something I Should Know?” over the one that opens Arena. I’ve since gone to a number of Duran Duran shows, and I have a better appreciation of Arena now. But the album was recorded so early in the band’s career that it really doesn’t tell the whole story — just that part known to most people. A Diamond in the Mind rectifies this gap and makes the incredible leap of sounding so polished, it could pass itself off as a studio album. The Manchester show recorded for the album in December 2011 followed a fraught-filled summer when Simon Le Bon lost his voice and the band didn’t know if he’d get it back. The worldwide tour set to begin then was hastily rearranged to give Le Bon time to recuperate. He sounds better on A Diamond in the Mind than he does on the band’s most recent studio album, All You Need Is Now. He’s got some really power behind his pipes now, and his tone is clearer than ever. Duran Duran have been touring for three decades, so the show comes off flawless. But that probably has as much to do with advances in mobile recording technology as it does the band’s natural showmanship. Every part of the band can be heard, and with Nick Rhodes armed with software samples, he can fill out all the missing parts that wouldn’t travel well. In a way, A Diamond in the Mind is a bit too perfect. Arena had a lot of raw energy that made many of the songs sound coke-fueled (which they probably were.) Even the band’s SXSW showcase had a few flubs that came off as charming than ill-prepared. The cleverest moment on the album comes at the end of “The Wild Boys”, where it segues into a brief quotation of “Relax” by Frankie Goes to Hollywood. More of this, please. Most importantly, A Diamond in the Mind fills the gap missing since the release of Arena. 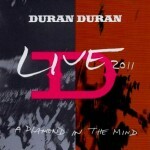 Now we have a(n official) live album that includes “Notorious”, “Ordinary World” and “Come Undone”. The picture is more complete. This is a masterpiece! DD forever. if yasmin puts an ordinary patch on herself, she still would be a perfect beautiful model. the same is with dd. whatever they do, it finds the way to their most loyal fans. and i agree, they sound much more mature than back then, but who is that one who can be sure if they were the bigger band at that time, or now?